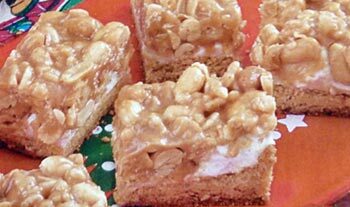 Both big and little kids will beg you for these yummy Marshmallow Peanut Bars. They are super easy to make since they start with a yellow cake mix and will bake in about 25 minutes. Perfect for as an after school snack or a great contribution for your next bake sale. If you like Payday candy bars, you'll want to give this easy cake mix bar cookie recipe a try. There's no caramel here, but the yellow cake mix, marshmallow, peanut butter chips and crispy rice cereal combine perfectly in crispy, sweet and salty Payday copycat recipe. Cut your bars either big or small - either way we promise they won't last long! Preheat oven to 350F degrees. Grease a 13x9-inch baking pan and set aside. In a large mixing bowl, beat the cake mix, water, 1/3 cup butter and egg until blended (batter will be thick). Remove baked crust from oven and sprinkle with marshmallows and then bake 2 minutes longer, or until marshmallows are melted. Remove pan from oven and place on wire rack. In a large saucepan, cook the peanut butter chips, corn syrup and 1/4 cup butter over medium-low heat until smooth, stirring constantly. Remove saucepan from heat and stir in crispy rice cereal, peanuts and vanilla. Spread warm peanut mixture over marshmallow layer and allow to cool completely. Cut bars into into desired size and shape.